What is Google Carousel Result ? SERP: What is Google Carousel Result ? How fast Google changes its SERP techniques. One a time it was limited to those 10 blue links only in SERP, but now after many updates of Google it it continue on the way to change search results while techniques are still same. The Google SERP (Search Engine Results Page) has turned into a to a great dynamic environment after a long years. Those days are gone when the ten blue connections that made up a Google indexed lists page. Google was showing on their SERPS at the time. These are the following search results showing by Google: Image results, Video results, New results, Blog results, Book Listings, PDFs, Local/GEO look Listings, Traditional Web list items, Product list items, Job list items, Financial/Stock list items. Today i also analyzed on Image Carausel result in Google SERP, when one of my friend asked about it, Actually it is from the time of Google Hummingbird Update to show results relevant in SERP. What is Google Carousel Results? Carousel results are part of Google’s Knowledge Graph results and in part were a precursor to results that we can expect to see from Google’s Hummingbird algorithm update where Google is attempting to deliver more semantically relevant search results. Carousel results are those results that you see running horizontally across the top of a Google search results page when you search for something with local intent or perhaps you are searching for your favorite team’s for T-20 world cup to start the season as I recently did when I performed a search for “Best Player of India” and was presented with carousel results: Sachin Tendulkar, MS Dhoni Etc. 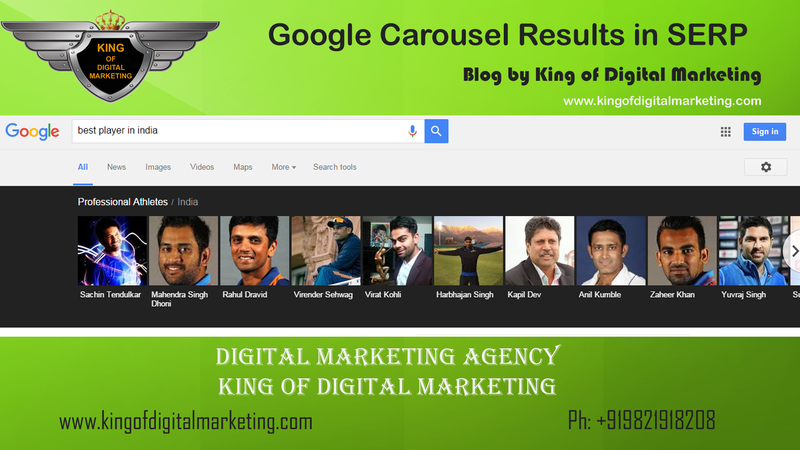 Google announced carousel results in June of 2013 but had been displaying carousel results via mobile since late 2012. According to Google, I’m not sure how Google determines what is “most popular” but I would guess that it is based in part on search query activity or click-through maybe both? Yes, From where do carousel results come from? This is an interesting question asked by my friend. In part carousel results stem from Google’s Knowledge Graph which in turns incorporates information from Wikipedia and from Google’s own database of facts, as well as through Freebase’s database of facts. What is interesting about Carousel results is that they (from our experience) almost always include images. Where they pull these images from is a great question. Most likely from a variety of sources including Google’s image results. Even it is not part of organic search result or paid search result, these results are from Google’s Knowledge Graph. Google is giving carousel results prime real estate of their SERP across the very top of the page. How can you appear your website in Google carousel results? Well you really cannot control whether you appear or not. In future, may be, Google can get paid for crousel results but now its not paid nor organic.